Made with a little bit of luxury, Obubu’s Genmaicha (玄米茶) or Brown Rice Tea is made with 100% Japanese-grown sweet mochi rice combined with our Sencha of the Autumn Moon. The strong, sweet flavor of the roasted brown fills the air as the tea steeps and mixes with the sweetness and bitterness of the sencha to produce a delicious and natural tea. Genmaicha has been a long time favorite of mine. Even when I wasn’t really digging a lot of green teas (there was a time when I was not as enthusiastic about green teas as I am now), I have always found a good cup of Genmaicha to be very enjoyable. So when I received this sample of Genmaicha, I was very eager to try it. And I am SO glad that I did! This is a delightful Genmaicha – one of the very best I’ve ever tried. What makes this one significantly different is the Sencha base that is used. 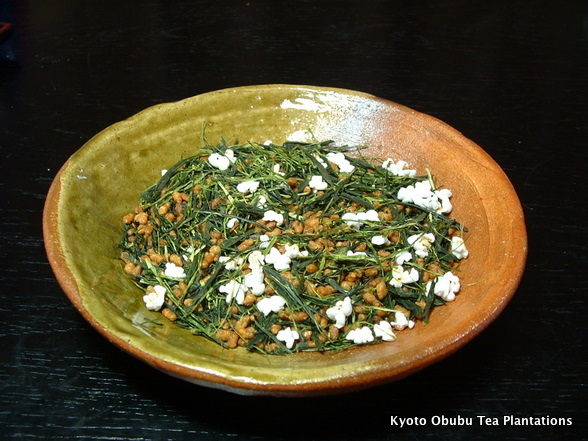 Very often, the green tea used to make a Genmaicha is a Bancha. Now, I like Bancha tea quite a bit, and even though Bancha is actually a lower grade of Sencha, Sencha and Bancha teas taste a bit different. Bancha teas tend to have a natural toasted flavor to them that stands out. While some Sencha teas that I’ve tasted do have a slight roasted/nutty quality to them, it is not as prominent as the toasted note that I get from a Bancha. And these differences in flavor are significant when it comes to Genmaicha. As it is made by blending green tea with toasted and popped rice, there is a roasty-toasty flavor that is one of the most prominent (and appealing) characteristics of a Genmaicha tea. So, when a Genmaicha is blended using a Bancha, you compound that signature roasty-toasty flavor of the Genmaicha. But when a Genmaicha blend is made using a Sencha, the flavor becomes slightly different… slightly more complex. The backdrop of this tea is a bittersweet flavor – not bitter … but, as I’ve described on Steepster, it is more like semi-sweet to me. It has a pleasant nuttiness that is accentuated nicely with by the popped rice, which has its own natural sweetness. It is very delicious, pleasantly sweet, and extraordinarily delicious! Attention Genmaicha fans: this Genmaicha is NOT to be missed!